Mint is an ancient herb used for its culinary, medicinal and aromatic properties. Being that it is a perennial herb and that it grows well in Hawaii, bunches of freshly harvested mint can be found in farmers markets everywhere in any season. It is used fresh in salads, dressings, juices, cocktails. It is a staple in Vietnamese, Lao and Thai dishes. – Always wash and dry your mint before eating. 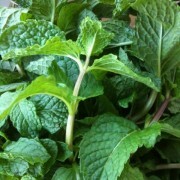 – Mint is added fresh whole or chopped to dishes. – There is nothing more refreshing than a tea made simply of fresh mint leaves. You can add touch of honey too. – Add sprigs to a pitcher of iced water to freshen. Cut fruits and cucumbers too. Select bunches free of wilt, brown spots, slimy stems. To prolong the life of your bunch free it up from the twisty tie or rubber band and place in a cup of water in the refrigerator, stems down, with a plastic bag loosely covering the top. Change the water every two days. This may help your mint to last up to a week.